This is a quick tutorial for an easy little draw string bag. I fill these with my favourite spices and scents to hang on my sadly fake and scentless Christmas tree. Wafts of cloves and cinnamon, rosemary and lavender. But they are equally lovely hung on door handles or in closets for a burst of festive scent. If you want to make your gift wrapping that little bit extra special these can be used as gift tags and be filled with little soaps, scent beads, or sweets. They are a great way to use up odd bits of ribbon and string left over from crafting or wrapping. 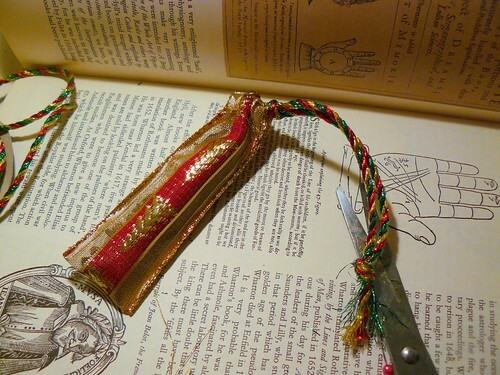 To start fold down each end of the ribbon 1/2 or 1/4 inch. 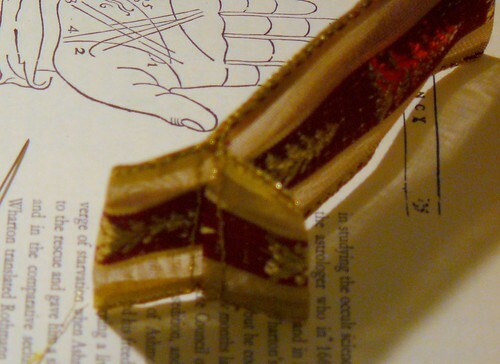 Make sure that the fold is on the same side for each end and that there will be enough room, after sewing, for your string or ribbon to pass through. 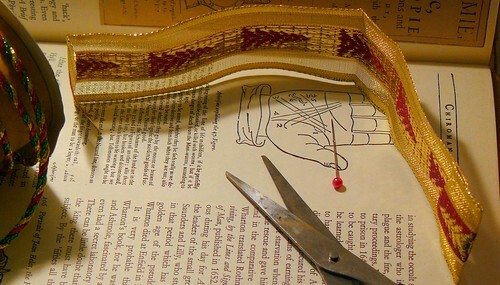 Sew along the raw edge of the folded end so that you get a loop at each end of the ribbon as pictured. This is where the string will go through for the draw string. 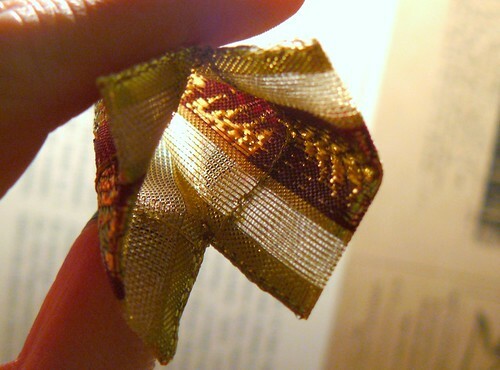 Fold the piece of ribbon in half so that the sewn raw edges of the loops are on the inside. Sew up each side to just where the loops start to form the bag. 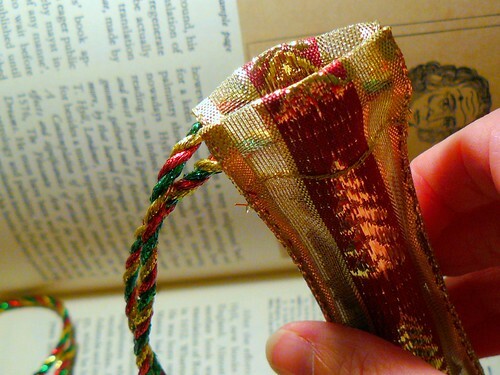 You should now have a little bag with two loops at the opening through which to thread the string. Thread your string through one loop and then through the next as pictured. Tie a knot at the end of the string. Fill up your bag with what ever lovely spice you like. Or sweets. Or a small gift. Draw the string to close the bag and tie a knot at the bag end of the string to keep it closed tight. You can change the length of the bag by making your piece of ribbon longer. I have found though that 8 inches is the shortest lenght that is easy to work with. I made a VERY long one of these to hold a pair of special chopsticks that were a gift for a friend. I have also used a longer version to wrap up insense sticks for hostess gifts over the holidays. 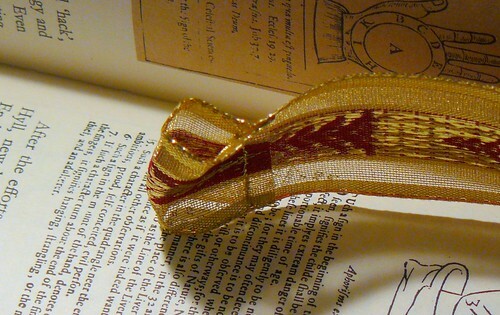 The ribbon I used here is quite narrow but this works great with wider varieties as well. To hold soaps or gift cards. Another thing I have found is that the ribbon with the wire in the edges works best as it holds its shape when you fold it and don't have to get the iron out! These are so easy to make. I can sit for an entire evening listening to music and turn out about 8 of these babies in an hour (depending on the size). It is one of my favourite holiday activities. And they don't have to be just for Christmas!